French Macarons!!! I know what you are thinking: “I’m not even going to attempt to make them because it’s too hard and risky”. Well…I felt the same way before and the first time I made them my meringue didn’t set, the second time they all cracked in the oven but after a while (and because I didn’t give up) I got the right recipe. 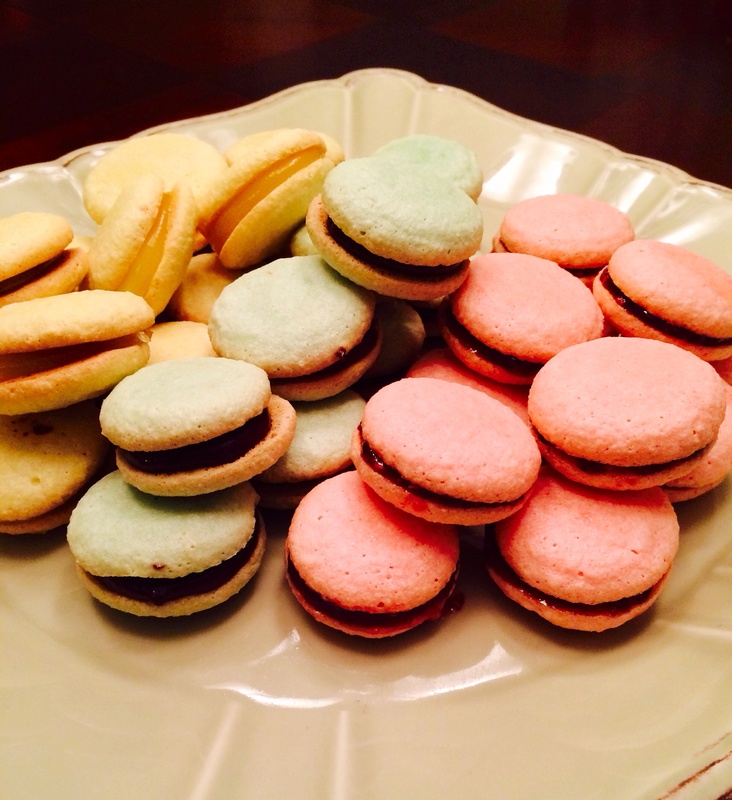 I will walk you thru in detail and give you the secrets for the perfect french macaron. The airy, chewy meringue and almond flour are the protagonists for this delicate french cookie. I see them retailed from $2.00 all the way to $3.75 each depending on location. I think they cost so much not just because they need expensive ingredients but because people right away think they are so hard to make that they don’t mind paying. What a great idea for a girl party as a goodie bag, on the dessert table or simply as a centerpiece. 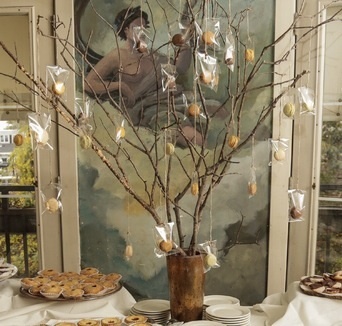 I have shared the picture of my wedding where we had them as a rustic tree centerpiece for the dessert table. The best part is that you can use you imagination to change colors, flavors and fillings. In the pictures you will see that I made a mint/chocolate ganache, raspberry with preserves, lemon/blueberry and lemon/lemon curd. Beat the egg whites on medium speed until they start getting foamy. Add the salt and increase the speed. Add the white sugar little by little as the egg whites become fluffier. Add vanilla at the end. When they form soft peaks is when they are done. I actually turn my mixing bowl backwards and the whites should not fall. On a different bowl sift the almond flour and the powder sugar. Mix them together. Add 1/4 of the egg white mix to the dry ingredients and fold them together. Add the rest and fold them again until they are all well incorporated. If you are going to color and add flavor to them this is the time. Just a few drops of food coloring until you get the desire color and about 1/4 tsp of flavoring. Try to use extract instead of imitation flavoring because it makes a big difference. I find that you need to use just a little bit versus the imitation that you need to add a lot more and it can give your batter a bitter after taste. Put the batter in a piping bag. Make sure there are no air pockets in it. Use wax paper on top of an oven sheet pan. If you are not sure about getting all the macarons the same size you can always draw them on the wax paper with a pencil using a round mold. That way you have a guide. Here is the major secret and what you need to do to have perfect macarons: after they are all piped like in the picture you need to hit the pan against your counter or table to take any extra air out. Maybe about 5 times. Let the macarons sit out for about an hour to an hour and a half. That’s very important to avoid them from cracking. Bake them at 300F for 20 minutes. Let them cool off and fill them with jams, curd, ganache, dulce de leche or Nutella.